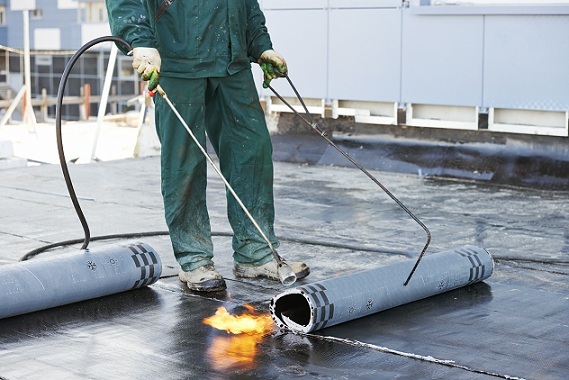 Bitumen-polymer roll materials are used in roofing operations. Their contents include modifiers (usually polymers). The modifiers help to avoid some of the disadvantages typical for bitumen materials. The base of bitumen-polymer materials is often made of glass fabric, fiber glass mats or elastic polymer fibers. Regulatory documents specify durability and stretching as quality factors for roofing bases. The most widely spread is glass fabric roofing. It possesses high rupture and needle tear strength. Glass fiber does not burn or rot and is bio- and waterproof. To provide glass-cloth with proper hardness, it is impregnated with special substances preventing impact of bitumen at high temperatures. To produce high quality roofing material, glass fabric should have fabric weight of at least 160 g/m2. Reliable adherence of bitumen binding to the base is ensured due to saturation of the latter with the covering or penetrating bitumen. Bitumen-polymer materials are more expensive than bitumen, but require less layers when applied. Besides, bitumen-polymer materials serve 5 to 10 times longer.